There's something a bit magical about late September nights, isn't there? We've had an unseasonably cool few days and the nights have been crisp. It's a reminder that Summer really is fading away. Suddenly the days are getting shorter, and every year around this time, I recap how my Summer was. For the most part it was good, but it felt unusually short and I didn't get to the beach much. I'm sure you can tell by my lack of a tan! September is a sweet month for me. With all of the birthdays and celebrations, the excuse to dress up is very real and I love every moment of it. Aside from the holidays, this is when I get the most use out of my formal pieces. I've worn every single little dress, all of my colorful pumps, and this pretty top (more than once). And yes, jeans CAN be formal when paired with the right shoes, bag, and jewelry. I go for a darker rinse with no distressing. Perfect for those in-between September nights. 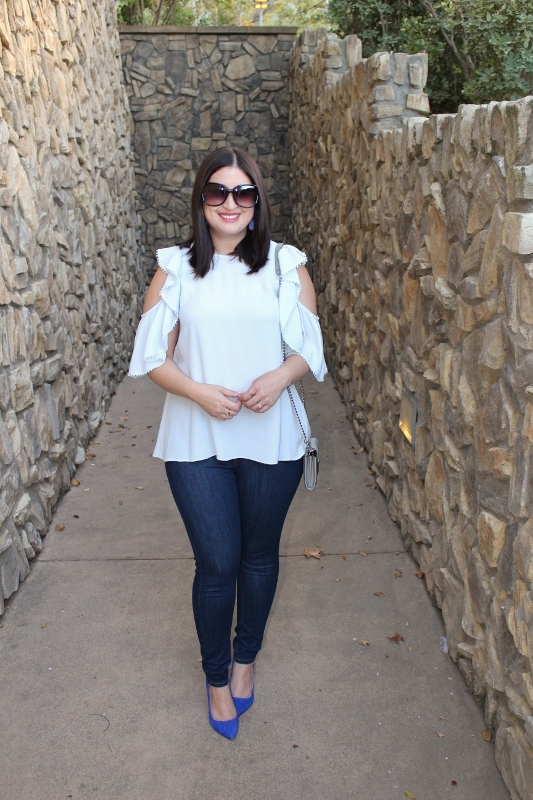 Linking up with: Gina, Amy Ann, Laura, Brooke, Carylee, and Rachelle. 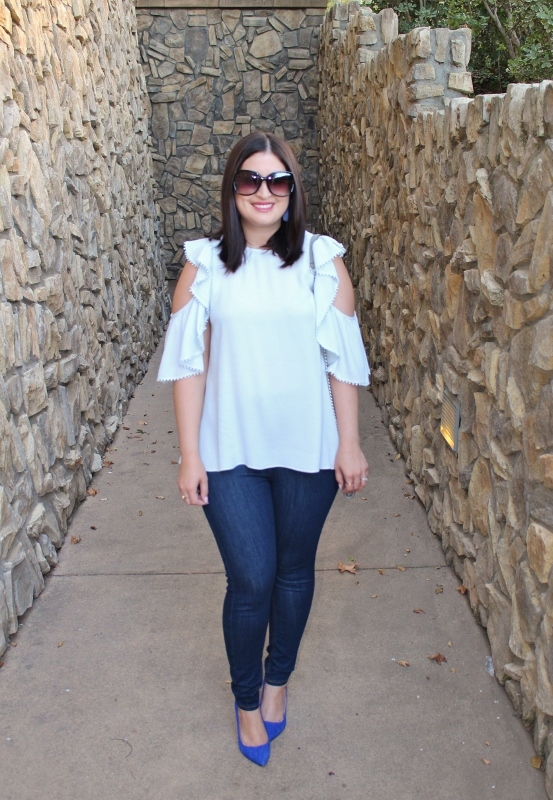 This is such a cute look Noelle and these jeans are a perfect wash.
Love this chic outfit, and your hair looks so shiny and pretty! We really lucked out with the weather this September. Glad you were able to make the most of if with all of your celebrations! That top is the prettiest - and the wallet on a chain looks so cute! I love the cooler nights in September when we can open the windows and shut off the AC! This outfit is perfect for those cooler days. I love that gorgeous top! Jeans can definitely be formal. I love this top with the blue pumps. So pretty! I love September too. We are having unseasonably hot weather here this week, lol! Like never been hot in Ottawa in September until now. Is your top a pale blue? Because it looks so on my screen. Either way I love your ability to do casual dress up. Also envious you can pull off the cold shoulder trend. That's a gorgeous top on you! I love the sleeves!! Perfect with the denim!